Timber Roof trusses are made up of 3 main structural members. 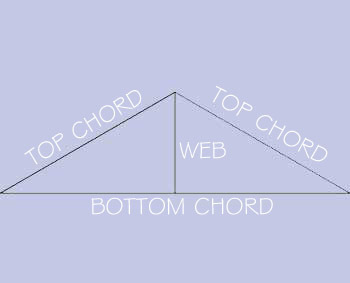 The top chord, the bottom chord and the webs. Webs have different profiles, and can go from 1 single web to many. 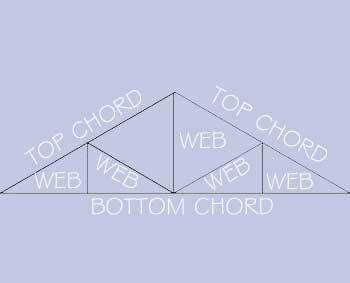 The amount of webs required in a truss is determined by the roof load on the top chords, the thickness and strength of the members, and the span of the truss. In the images below I have listed the common web profiles used. Generally it doesn't really matter what the web profile of the truss is if the roof truss is concealed inside the roof with a ceiling fixed to the underside of the roof truss. However if you are planning on having exposed roof trusses, you may want a certain look with the web style. You can inform the truss manufacturer or structural engineer on your preferred web profile style to see if they can desing it your preferred way. In the information below, I have listed an approximate guide of the truss spans suited for each web style profile - king post, queen post, howe and fink. Generally used in short span trusses, but can be used in larger spanned trusses if the structural members are increased in size and strength grade. Similar to the King Post, but also has 2 angled webs coming from the bottom of the main vertical post, out towards the top chords. Similar to the Queen Post but has additonal vertical webs where the angled webs meet the top chord junction. Howe profiles can keep extending the angled/vertical profile on and on. Fink web profile is made up on angled webs. 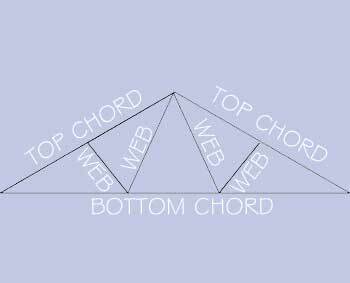 This is the most common web profile used in pre-fabricated roof trusses. 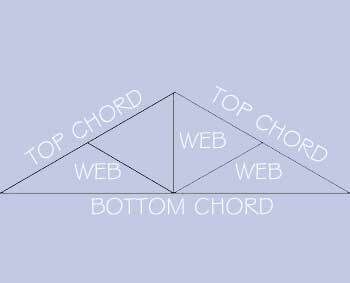 Fink trusses have at least 4 webs, but often many more on bigger spanning roof trusses.